I wanted to send groups mails with individual salutation at a scheduled date and time. There’re several free scripts / apps out there to do this. I’ve tried probably all of them but none really worked (I’m running on Snow Leopard). Ok, if I only wanted the individual salutation part, Serial Mail is a good one and it’s free. It doesn’t only support names as placeholders but also other fields in the Address Book. It’s also got an iPhone app! One very good news for iPhone user as the built in mail app in iPhone doesn’t support group mail. After many trials and errors, my final solution is “Automator + iCal". What about if you just want to SCHEDULE ONE SINGLE EMAIL? * It’s VERY IMPORTANT to save your workflow as APPLICATION in scheduled email. If you save it as workflow, it’ll only call out the workflow without running it, which means… it won’t do anything. * NO ATTACHMENT: Someone said here that we may add attachment to group mailer in Automator but it never worked for me. And even if it works, it won’t work with scheduled mail anyways – it requires manual input when mails are being generated. My workaround is to upload the file to a server / website, then paste the link in the mail body. The “New Mail Message" in Automator does recognize URL so if your recipients can see HTML mail, they should be able to just click and see your file. Make sure you also read the “easy way" post as well. That one should be less cumbersome. hi, thats a great post! everything works but for some reason the emails signature is not included and the automator just generates each personalised email but it doesnt send the emails? any idea how to solve these two issues? thanks! Do you mean the email signature you’ve assigned in Mail app? That doesn’t apply to the mails generated from Automator. You’ll have to paste it in the mail you write in Automator (and sadly, formats like font size and color will be gone as well). Btw, I’ve recently experienced some bugs in Automator generated emails: some of the mails generated are blank. So, be careful when you use Automator to generate emails! I’ve filed a bug report to Apple but you never know when Apple would actually address the bugs…! 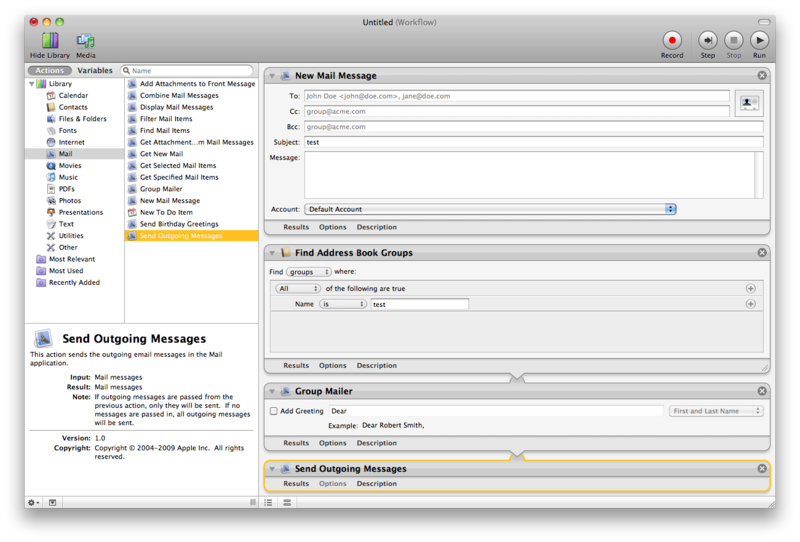 About sending out the emails… you sure you put “send outgoing messages" in Automator? I’m not sure why. But do check out the “easy way" post (there’s a link in this post… in the very first sentence), that one should work more easily. Thanks very much for your write up. I got it to work, but also notice that there’s no SIg file attached to the created emails. That’s fine, I guess. I think that everytime I run a test, an email with no addressee is left open in my mail program. Using a greeting appears to cause a problem, I don’t know why. No greeting, the emails send fine. With greeting, I get an error (check the action’s properties and try running the workflow again). PS. Serial Mail gagged on something and didn’t work. Somehow it’s there. Can’t understand why and can’t get rid of it either. great solution. I’m having some trouble sending bulk emails. I followed your instructions, but as soon as automator runs the “" section, It creates different email messages without content, only with the “salutation" from the group mailer block. It seems like the group mailer will delete the content to put the salutation. If I run it without salutation, it will work exactly as you write…. I’ve been experiencing the same problem for some months, too. Haven’t really figured a way to fix it yet. Could be a bug in mail app introduced in recent updates. This method was very reliable back then. May have to file a bug report to Apple. Sigh… Will reply you here if I somehow figure out how to fix this. Thank you! This totally worked. Lord knows why you just can’t do it from within mail, as in outlook.